Our Hulled Hemp Seed. High in Protein and Highly Nutritious. Great for a wide range of food applications including Salads, Smoothies and can be used as a Rice or Bread Crumb alternative. Chemical Free, GM Free, Dairy Free, Gluten Free, Low GI, Low Sodium, No artificial colours or flavours, Preservative Free, Vegetarian. Hemp is a great source of Plant-Based Protein including Omega 3 and Omega 6 in the perfect 3:1 ratio. It is also a source of Magnesium, Zinc and Iron. It also contains free radical fighting Anti-oxidants and is a good source of Fibre that can help reduce Cholesterol and may also help Stabilise Blood Sugar. Our Hemp is Chemical Free and grown in the world's Cleanest and Greenest Cool Temperate Environments. 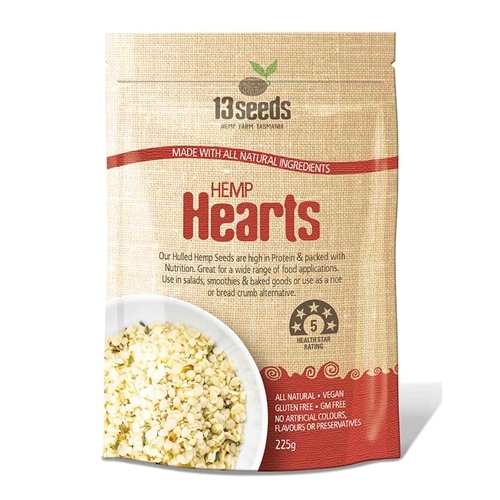 The Hemp contained in this product was Grown and Harvested in Canada by our Tasmanian growing partners and Processed and Manufactured in Tasmania by 13 Seeds. Directions: Use as a Bread Crumb or Rice alternative. Add to Smoothies and use to top Salads. Be experimental as Hemp Hearts have a variety of uses!